SHIELD's back! The mid-season premiere (that's a thing, right?) seemed a lot stronger than the mid-season finale (a term that makes even less sense). Now, let's see what Marvel connections can be freed from the memory blocks. The return episode seemed faster paced than previous episodes, plus there seemed to be a willingness to throw in (admittedly random) Marvel references, advance the plot and give characters some more depth. All good things. Now if they could do a bit more to draw in audiences, we'd have a winner. First, the traditional spoiler-light recap: Coulson is missing, Peterson is feared dead, and the regular cast is at the mercy of Victoria Hand. If only each member of the team could use their special skills to get Coulson back and take out season-villains from Centipede. What's that? They can? Coolbeans. Vanchat finally appears - and he's a pushover. Look, it's not like this guy was built up as a "Big Bad" or anything, but he's been mentioned repeatedly in various episodes, including the Pilot episode in which Ward was out to get him, and perhaps more significantly, in "Eye Spy" where it was revealed that he had "gulags." It was during the 2009 gulag-mission that Coulson's previous team was killed, except for Akela, who was captured (apparently by Centipede). You'd think anyone who has his own personal gulags would be a lot tougher than this. Also, I thought he'd be older. May and Ward deploy a SHIELD Roomba (new in this episode) to flash grenade Vanchat while Fitz-Simmons use the newly weaponized Seven Drones (from the pilot episode) to corner him. There's even a Night-Night knockout watch; it's no Repulsor Watch, but watchyagunnado? Good to see SHIELD agents using their tech. Oh, and aside from being a VTOL vehicle, the Bus has a strange high-tech sunroof-thingy for the interrogation room that somehow causes suction effects similar to when the side of the plane's walls were blown open in "0-8-4." On that note, Fitz drops the most blatant Marvel Easter egg for the episode, by telling Simmons to "Embrace the change." This was the catchphrase was the teaser for Marvel's 2008 event, Secret Invasion, in which Skrulls secretly replaced key people all around the globe and then announced they had already conquered Earth, without so much as a fight (the fights happened later). For the Marvel Cinematic Universe, Skrulls are likely personae non gratae (creaturae non gratae?) as they may be saving them for Fox's Fantastic Four films, in which case the nearest equivalent would be the Chitauri. Speaking of which, Chitauri tech is shown here as the not-so-secret invaders from the Avengers movie are name-checked again. After interrogation, they dump Vanchat off at the Fridge, a secret SHIELD facility first mentioned in "The Asset." Considering they dropped him off without a trial (or any apparent call for one) at a facility that does not even legally exist, and considering Skye later used the Fridge as an empty threat against a guy she was intimidating - it sure seems like this is SHIELD's Guantanamo Bay. Played up right, this could be a really, REALLY great analogy for the real thing in a future episode - or it could just be ignored and treated like a holding space for characters and concepts left in TV limbo. I'm hoping the former; I'm fearing the latter. If we had a Monkey: Secrets of SHIELD episode "The Asset"
Third episode, second full rundown of random Marvel triva. This episode introduces two new SHIELD agents: Agent Kob (who gets yelled at by Fitz), and Victoria Hand's "best interrogator" (who does nothing before getting showed up by Ward). Too bad neither had lines. Still, we get some SHIELD cameos as Victoria Hand returns, first seen in "The Hub," and Nick Fury gets a blink-and-you'll-miss -it appearance. We also get a few tidbits about the main crew: Simmons has a thing for "manscaping," Coulson thinks he can pull off a phrase like "so clutch," and Skye wants to try Agent May cosplay. There's even a callback to the pilot episode with Skye throwing in a "don't touch Lola" reference (and yet they haven't flown it since the first episode). ​Slam and Cram: Secrets of SHIELD episode "The Hub"
Speaking of Skye, after trying to hack into SHIELD with any computer available (including a car's GPS navigation system? ), she steals a car in front of (not very observant) valets, crashes it to cause damage to public property, then uses OnStar to get a towtruck to take her "home" - all in an effort to get info from Lloyd Rathman of Kester, Dyer and Rathman LLP, a shady financial guy tangentially connected to Centipede. Does OnStar work like that? If their system detects a collision, and the tow guy describes what he saw, they are basically helping you leave the scene of a crime, turning a minor ticket into a potential felony (depending on local laws). Hmm... Then again, this is the same company that helped Batman take out the Joker, so maybe they make exceptions for superheroes. Of course, the meat and potatoes of this episode involves the death and life of Coulson. Raina claims Centipede (and the inegmatic Clairvoyant) are interested in the secret of bringing agents back from the dead - a useful trick when building a supervillain army. In the comics, this is something both SHIELD enemy Baron Strucker of Hydra and X-Men enemy Mr. Sinister have mastered, as they routinely allow their agents to die, only to clone them again later. Centipede is no Hydra, but it wants to be. Redacted: Secrets of SHIELD episode "Girl in the Flower Dress"
To "break" Coulson, she plays a little good cop/bad cop with Po, telling Coulson about his recently-lost cellist lover (hinted at in "The Well"). This seems like the straw the broke the camel's back as Coulson finally submits to the memory retrieval techniques. We learn more about Coulson's personal background. Aside from his lost love, he had a "defining moment" when his father died while Coulson was young, and he more recently lost his mother. Oh, and he surfs. 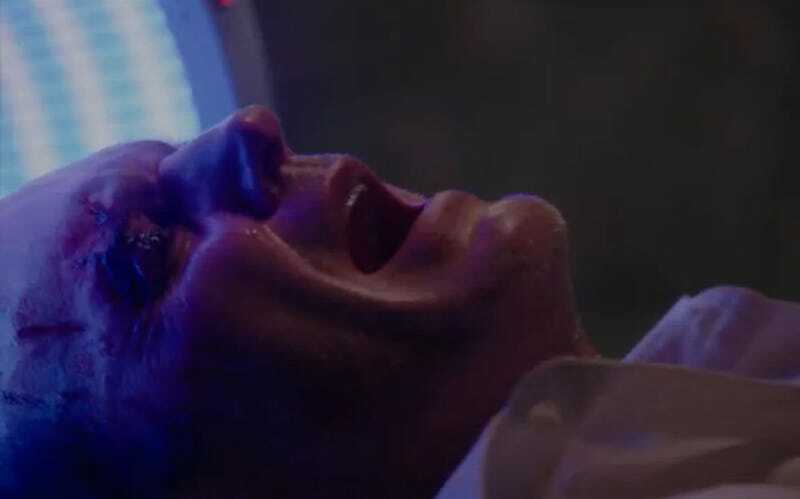 Dr. Streiten, returning from the Pilot episode, explains that Coulson was dead for days, and during the long process of rebuilding him, they had to give him fairly painful - and vividly horrifying, brain repair surgery. As Coulson glibly put it, "They were just messing with my head." This necessitated the memory implants - something Marvel has a long history with. Wolverine is, of course, the most famous example of memory implants, but everyone from Captain America to Deadpool has suffered from this plot device from time to time. Of course, the real problem is, as Hand puts it, "No agent is that important." Is it just affection that led Fury to invest what is apparently millions of dollars, days of labor by specialists and tons of above-top-secret red tape to revive Coulson, or is there a reason they needed him alive? The episode's villains are wrapped up rather nicely as Vanchat is in the Fridge (SHIELD's own gulag), Po is incapacitated by what appears to be the same sonic device used by Obidiah Stane in the first Iron Man movie (though Raina claims she killed him) and Raina herself is sent off for interrogation (I'm sure that guy will walk around and stare at her, as he did Vanchat). Meanwhile SHIELD believes Agent Trainee Michael Peterson is dead (or suspects, they didn't test the body yet as of this episode), when in reality he is again in Centipede's clutches. Next week, Lola flies again!